I was checking what is available on the Smashwords e-book website on cycle touring in Europe, last night and discovered that Selwyn Parker's "Chasing the Chimney Sweep" can be bought there. "Chasing the Chimney Sweep" is an account of four friends who followed the route of the first Tour de France for a month during one summer about a decade ago. The book was originally published as a paperback by Penguin in Australia or New Zealand. Friends who visited NZ, brought back a copy and lent it to us. 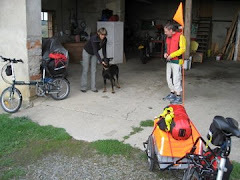 It is an excellent description of a long cycle tour through the French countryside, including what can go wrong. The history of the early Tour de France is recounted in fascinating detail. Those early cyclists make the rest of us look like milksops and the bikes were definitely instruments of torture. He thinks, for example, that using panniers is "uncool" for stylistic reasons and he and his partner cycled with heavy rucksacks. Unfortunately they happened to choose the hottest summer since records began and so cycling wearing a rucksack was very uncomfortable. They needed to send some stuff back to the Antipodes by post. The other couple camped and used panniers. They appear to have fewer problems. He then moans about the cost of using the French Postal Service. Unfortunately he doesn't agree with the idea of "When in Rome…". He dislikes French coffee, because he likes to drink a very weak milky coffee at breakfast and the French hotels don't offer exactly what he wants. However we recommend the book highly with some reservations about rucksacks and coffee.